David Schmitt and Tommy Cooperman, better known as Breathe Carolina, have had a long and transformative career throughout music. The duo from Denver, Colorado have been influential in electronic music since its early days, and especially since they burst into this scene after coming from the alternative/ punk-rock sphere. Post-rebranding their sound, Breathe Carolina has been conquering the dance music world with support by Spinnin’ Records. The pair just made their impactful landing in Miami with a handful of events for Miami Music Week, with one being co-hosted with Bassjackers at Red Room. They were also featured in the legendary Spinnin’ Sessions lineup at The Nautilus as well as The Young Gunz Showcase. With years of experience behind them, the duo had a lot to share about their musical changes and tips for making it in the music industry. 2019 is already off to a rockstar beginning for Breathe Carolina, who recently released their brand-new single “Stronger” alongside Raven & Kreyn. Fans have also continuously been playing their energy packed remix of Cash Cash’s hit “Call You,” and this is only the tip of the iceberg for new tracks this year. The guys are en route to cities across the US and Canada as we speak, including Washington D.C, Ohio, Montreal, New York, Chicago, Ottawa, and many more to be announced. 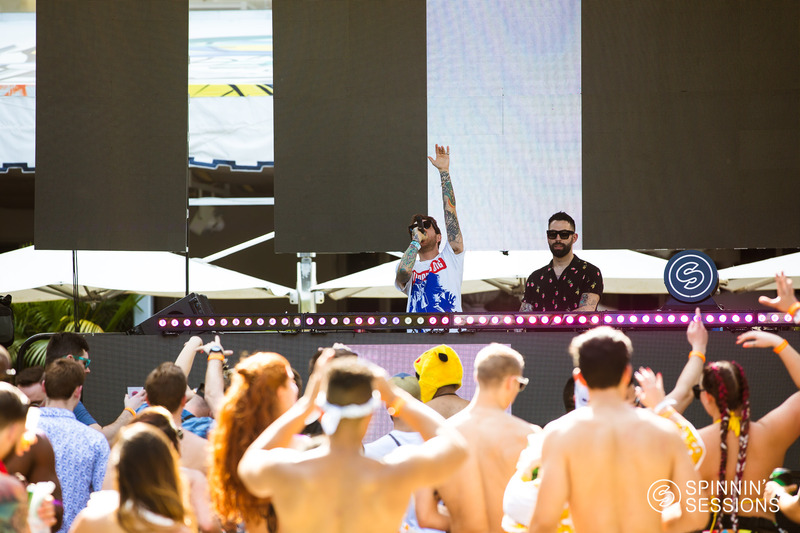 To top off all the thrills, Breathe Carolina have locked in a residency at Vegas’ KAOS and are ready to throw down for crowds all season long. Nocturnal Times: Hey guys, how have you been enjoying Miami Music Week so far? Breathe Carolina: It’s been awesome, this is our fourth year here. It is basically a working vacation, so you feel like you’re still doing something despite having a great time haha. The more you do it, the more you figure out what you need to do. You start to alleviate stress the more you know what to expect. Nocturnal Times: Completely understandable. How does this week compare or differ to tour life for you? Breathe Carolina: It’s pretty much the same, wake up and play a show, except we don’t have to go the airport haha. It’s like the times are wild, on a normal show day we don’t have stuff to do until like midnight. Here it’s like we have a meeting at 11, 2pm show, and then a show at 3 am. Yeah we are playing at 6am at E11even tomorrow so, it’s crazy. Nocturnal Times: Absolutely, this week has events happening every second of the day. Besides this week, do you like playing festivals or shows more? Breathe Carolina: I mean we love a 300-cap sweaty room that goes crazy, but we also love festivals. We don’t necessarily love super bottle club service type shows since it doesn’t really fit our vibe haha, but we will play it and do a good job. When you be yourself fully and the crowd loves you, that’s it. Sometimes we have to tone it down a bit so we don’t piss off the club owner though haha. Nocturnal Times: With changes from alternative to electronic in your music, how long has it been in total that you rebranded Breathe Carolina? Breathe Carolina: There was a year within the four years that was inactive. The first 2 years was just building us up again to get this new idea across since nobody believed in us at a first. Our team thought we were psychos, so we had to switch management and agencies. Now, it’s completely all we do. Nocturnal Times: Overall, you’ve had quite the musical journey thus far. Playing festivals like Warped Tour was a totally different crowd, how do you feel your music has changed these past few years? Breathe Carolina: I don’t know haha it’s crazy. A lot of fans don’t want artists to change and so they can be cold towards you. If we didn’t change though we would still be in that scene which is really not there anymore. We have been doing electronic music since it started, so we have been looking to keep rebranding ourselves to adjust our vision. We have been doing this for 10+ years and not a lot of people can say that in this industry. The scene is now bigger than ever which is so weird because when we started it wasn’t like this. We basically set a reset button on our career. We lost fans but gained new ones. Nocturnal Times: That’s great to hear! How have you adjusted your performances to fit this new style? Breathe Carolina: We don’t have the instruments obviously, but it’s still just as hype and wild. Towards the end of our time with Warped Tour, we started just doing DJ sets. We would still have a crazy drop, but we had live drums. I don’t sing as much live anymore, but we still have the same punk rock energy. Our music is still super aggressive. We scare half the people or it’s insane hahaha. Nocturnal Times: Your music and performances have always been filled with high energy, but what do you think your turning point was for you when everything came together? Breathe Carolina: There really wasn’t one haha. There was a lot of little ones that lead to it. All of our accomplishments were just chipping away at it. For example, a song would do well on Beatport or we would sell a club out. There was no linear pattern, it was one thing after another. We tell young guys a lot that unless you have one song that’s huge, it’s steps every day and there is no defining moment. This market is crazy, there is a lot of pressure to make it out here. Nocturnal Times: It must have been difficult to make that decision and those changes. How has the process of making your music changed? Breathe Carolina: It’s definitely faster now. We used to spend a year on an album with 12 songs and everything leads up to it. Also, we don’t get let down as much now. We used to spend so much time on an album, and maybe only 1 or 2 songs do well. The label also wouldn’t really care. When we work on a song we release it right away now. We put everything into it. Video, content, artwork, so every song has its own life. Whereas 8 songs on a previous album may never see the light of day. We have so much more freedom working with Spinnin’ Records.